Happy December! Are you ready for all that my favorite month brings? I am. Currently my Indie Holidays Pandora station is creating quite a festive ambience as I sip coffee and write this post for some seriously delicious gluten free quick bread. Since becoming friends with several gluten free eaters it’s been a personal challenge of mine to create gluten free recipes that are just as delicious as non-gluten free ones. 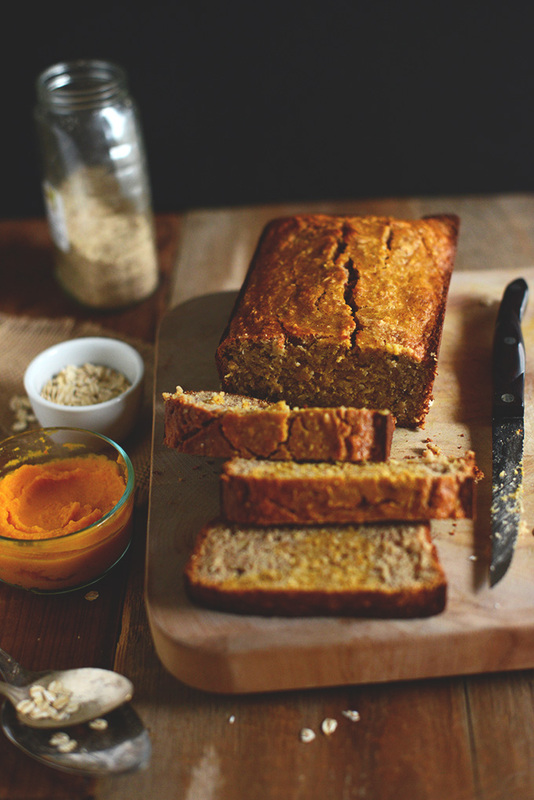 And I’m happy to report that this simple, ONE BOWL banana bread is one of them. Hoo-ray! Even better news? It only requires 1 mixing bowl. 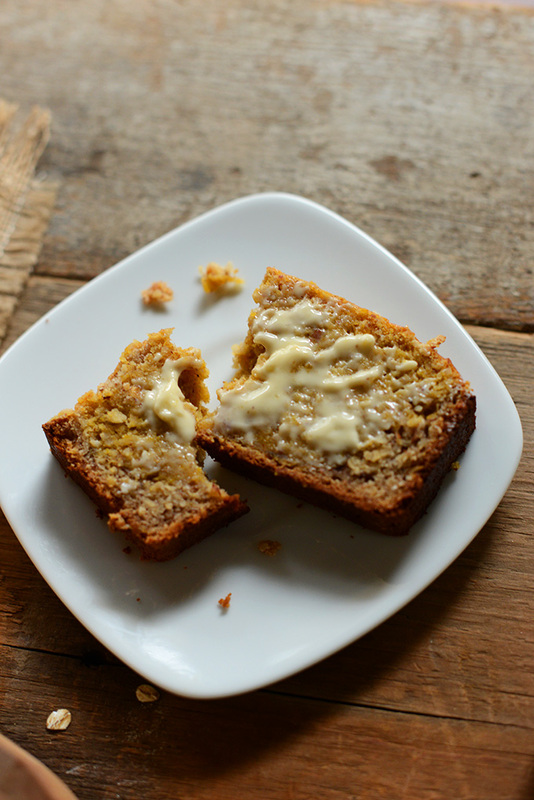 Easy, simple, and delicious banana bread? Score. What does this gorgeous bread taste like? For starts, not gluten free at all! This bread is absolutely perfect for serving to a crowd. You get the point. This recipe is really ideal in any setting, even to bake on Sunday and have for breakfast or snacks throughout the week. Enjoy! This came out great!!! Used a hubbard squash I grew in my garden. I used spelt, sprouted oat, and almond flour. Also used coconut sugar, maple syrup and raw turbinado sugar. Enjoying it so much with a cup of tea. Thank you Dana and husband! This is GREAT!! I made it last night for a study group this week–I’m anxious to serve it to others. Knowing that I didn’t have almond milk or almond meal, I decided to try subbing coconut milk and coconut flour. Since coconut flour soaks up liquid, I used extra coconut milk–1 1/4 c and a bit less coconut flour for the almond meal–1 cup. I also used about 1 1/4 c of squash. When I mixed everything up, it looked too dry, so I added water until the consistency looked like the batter in your pic, about 1/4 c. None of this was as exact as I try to be when I bake–I’m NOT a confident baker AT ALL–But it turned out beautifully. 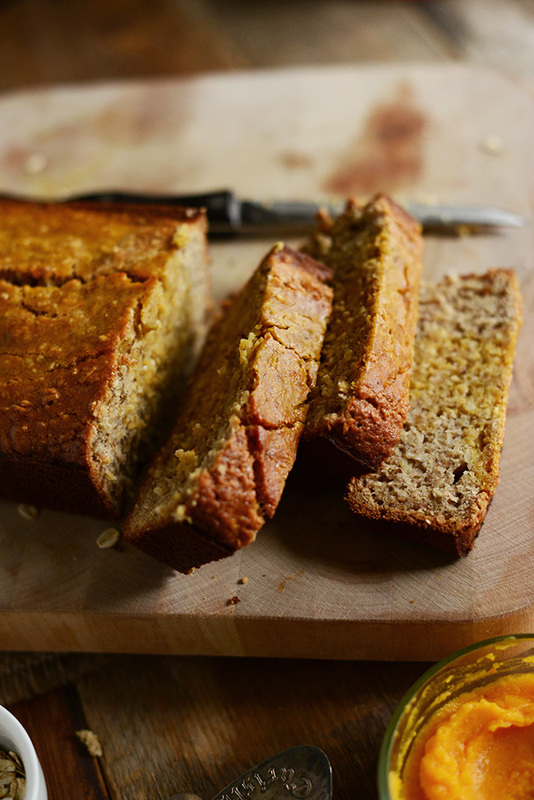 It’s moist; it holds together; it has the right amount of banana flavor. I am definitely adding this to my very tiny arsenal of gluten free baking successes. Thank you SO MUCH for this wonderful, versatile recipe! Hi Dana! i made this banana bread but after an hour i poked it with a knife and it did not come out clean.. i ended up having to cook it for about two hours until the inside was cooked but then the outside was burnt. The inside of the bread tasted amazing but would love to get it perfect, any suggestions? Hmm did you happen to make any recipe changes? Let us know and we’ll do our best to help! How do you make the butternut squash puree mentioned in the recipe? I didn’t understand what part of the link provided is used for the banana bread. Preheat the oven to 375 degrees. Place the squash halves, cut side down, on a baking sheet and roast for 30-40 minutes or until fork-tender. Scoop out the innards into a bowl, mash with a potato masher or puree with a food processor! I just made this & am so disappointed. It was the bread that never baked. The outside got nice and crusty, but the inside is basically raw. What a waste of a lot of expensive ingredients. Hi Dana, can I replace almond meal with all purpose flour? Hi Keisha! We haven’t tried it, but if you do let us know how it goes! Welcome fall flavors! Delicious and simple to make. 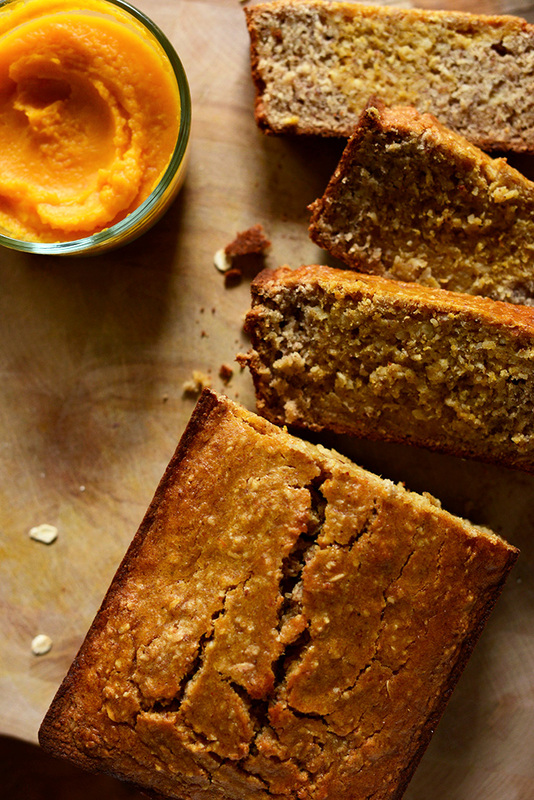 Perfect for breakfast with persimmon slices and coffee ? may I ask you to convert cups to grams and ml in this recipe, it is always a huge problem to find right converter. Thank you in advance. This was amazing! I ran out of GF flour blend after 3/4 cup so I subbed the remaining 1/2 cup with almond flour, and subbed sweet potato for butternut squash as that was all I had. Baked for an hour and it was PERFECT! Thank you!! I’ve been experimenting with banana bread recipes using some of thegluten free alternative flours. Yours looks great, and I’m about to try it, but would like to know if coconut flour can be substatuted for any of the flour? Thank You! Amazing recipe. I made it for my family and they loved it! The only substitute I did was swapping cane sugar for coconut sugar and it turned out fabulous. Thank you it’s a keeper ! I made mini muffins with this recipe last night and they are wonderful – a huge hit with my family. I actually used acorn squash. I thought they were sweet enough without the added honey. I also added 1/4 cup more flour after the first batch because they were mushy, even after I baked them quite a while. The extra flour gave them the body they needed. THANK YOU!!! Hi I don’t understand these instructions which does not mention several of the ingredients listed?? For example the instructions don’t mention sugar, baking powder, coconut oil etc – all things that are on the ingredient list. I love this recipe. I make it regularly for the kids’ school lunches (school isn’t nut free). I just chuck the pumpkin in rather than swirl it through. 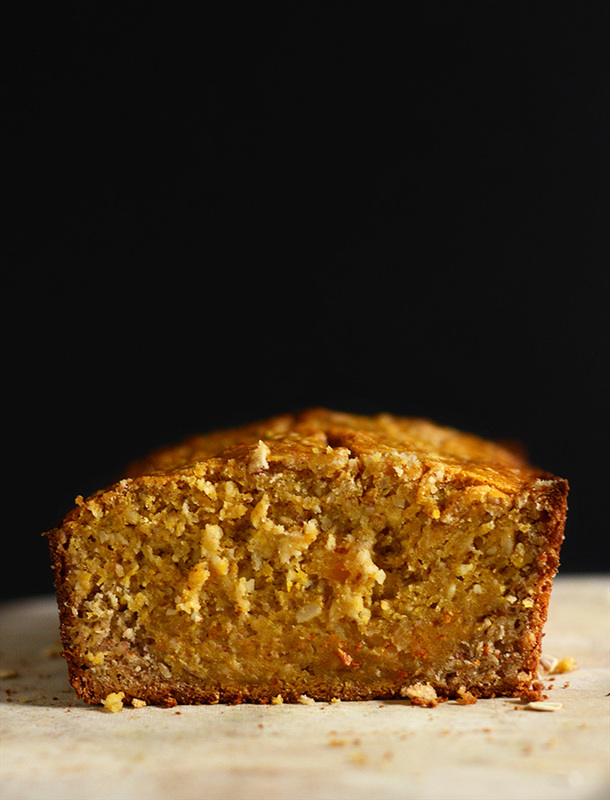 It gives it a lovely golden colour instead of the regular “grey” colour of banana bread. I made it without the pumpkin once and it didn’t look nearly as apertising. Lol. Mine is delicious, but it came out very heavy, not sure if that is how it is supposed to be, and very moist. My batter was very think, almost like I could have made cookies from it. Is that correct? I didn’t see at picture that came close to mine once the dry ingredients were added. Hi Dana can I sub almond meal with coconut flour? I made this last night. I also love the butternut squash in it! 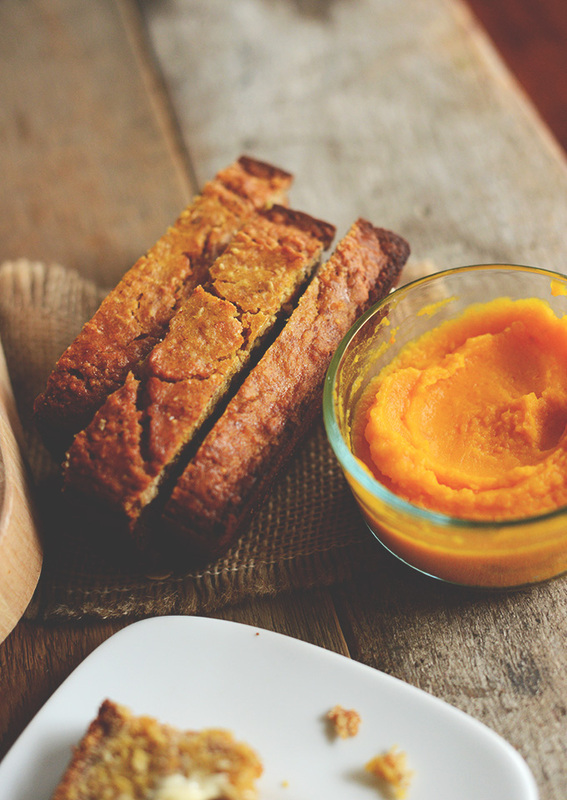 I used organic pureed butternut from a can because I already had that at home. I substituted the sugar with more honey and maple syrup, the sweetness from the banana and squash also helps. I used 1 1/4 cup almond meal, half a cup all purpose wheat flour (so not GF), half a cup of brown rice flower and 1/4 cup spelt flour. I used 1/4 cup dairy milk and 1/2 cup soy milk. And added a little bit of walnuts and cardamom too. It turned out GREAT! A sign of a truly good recipe is one that can be adapted and changed and still turns out delicious. Hello. Thank you for your own tips. I do have a question: Do I have to use sugar, and brown sugar and honey or I can pick one of the three? Please I would like to read your answer. 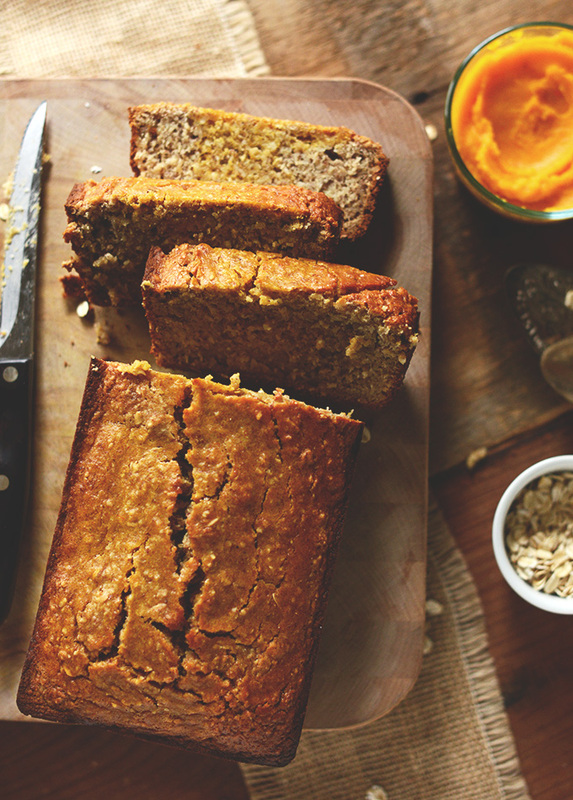 Hi – just discovered your wonderful site, and this wonderful sounding banana ‘bread’…but wondering if you had any thoughts on how to make this yummy recipe totally grain free?! Big ask I guess but….?! I was wondering, what can I use to substitute the almond meal part of this recipe? I am allergic to all nuts. I would love to try this recipe out! 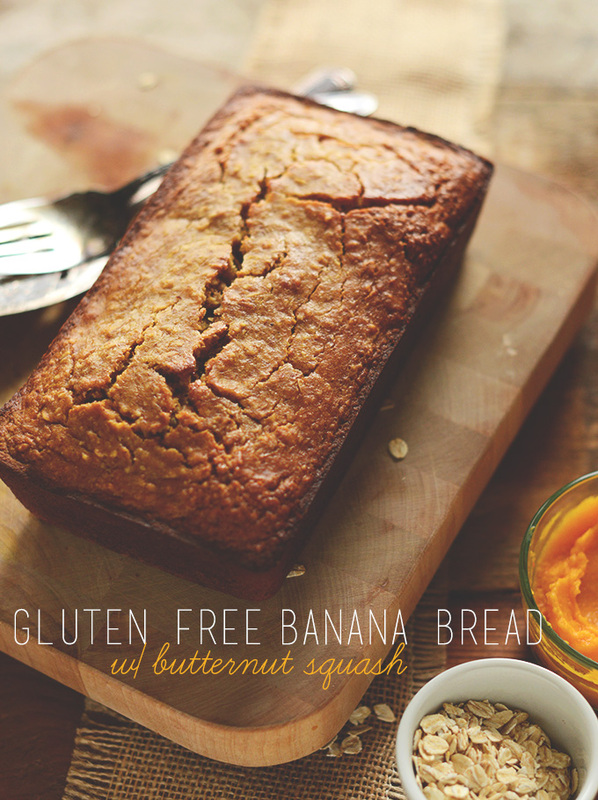 This gluten-free butternut squash banana bread looks so good! 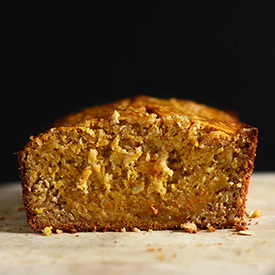 If you’re fine with it, I’d love to use one of your photos with a link back to your original post (https://minimalistbaker.com/gluten-free-butternut-squash-banana-bread/). Sounds perfect!! Question: Why is the cal. and fat content so much higher in this vs. your banana bread recipe? I don’t see much of a difference in the contents. It’s probably calculated using different fats, as well as a different serving size. Did you see the part where it said “Add eggs through milk”? Yeah, and I (doh) thought it meant add eggs to the milk. LOL! I did swirl the squash though the first half of batter and then added the rest. But, when it was done after an hour and 15 minutes, the squash didn’t blend well like that and it was sort of raw in the middle. Sorry, not my favorite. I thought the same thing as Christine, that you left out a bunch of steps. Thought is was just me. I figured it out but had no idea what you meant by “add eggs through milk”. I also thought that meant and eggs to milk. Perhaps you can re-word that? I added that in! Sorry for the confusion. I hope you find the updated instructions easier to read/follow! It’s very standard – 9×5 inch I think. I AM MALING THIS RIGHT NOW AND AM NOT SURE ABOUT THE HEAY OF OVEN. I SM IN AUSTRALIA SND MY OVEN MAX OS 250. I’M ASSUMING THAT 350 IS A VERY HOT OVEN. You probably use metric in Australia, 350F is 175 to 180C. Have you edited the recipe since your original posting? The directions don’t mention use of many of the ingredients, like the spices, baking powder, honey, etc. I managed to wing it and it still tasted amazing. But it would be nice to have a full set of instructions. Thanks! Oh whoops! Never mind, I just saw the “add eggs through milk” comment. My mistake! What flour can I substitute for the almond meal? Should I double the gluten free blend? Yes, add more of equal ratios of oats and GF blend! I just wanted to point out that the sugar, oil, baking powder etc, are missing from the instructions. i just added them to the batter and everything turned out great! I love this recipe! I will probably add one more banana to the batter but that’s just personal preference. Oh, i also sprinkled a little extra sugar on the top before baking to give it a sweet crunch…delicious! Also, i used coconut sugar and it came out splendid. Hi Carol! Thanks for your note. I actually instruct to “add eggs through milk”, which includes those ingredients. Sorry if it was confusing and I’m glad it still turned out! Thank you! That it’s funny because I sat there for a while staring at the words ‘add eggs through the milk’ and I had no idea what that meant! So I put the eggs in the milk and whisked those. For the sake of international readers it’s useful to know that saying “x through y” in the sense you mean it here isn’t very common outside of American English so that part of the instructions might not make sense to people outside the US! I made this with corn meal and applesauce, since I didn’t have almond meal or butternut squash, and it came out great! It’s a little bit crumbly, but that is to be expected with gluten free baking. Next time I will add in some xantham gum to help bind it. To answer the three posts above, the directions say to add ingredients “eggs through milk”, which means to add the eggs, the milk, and everything listed in between them. I just made the recipe exactly as it is stated above. I gathered all of the said ingredients. But, when I read thru the directions, I could not find how to use half of the ingredients… The oil, spices, sugars, honey. I just guessed my way so that they were all included. It came out great texture and taste. But, I would have liked better directions, please. Just in case others are reading this and have the same question, I had to do a bit of a double take when reading the recipe for the same reason, because of the way it is worded. In step 2 it says “Then add egg through milk and whisk until well combined” which means add everything listed in the ingredients from egg to milk. I’m English so this way of saying “x through y” isn’t how we would phrase it but it seems to be common in American English to mean “everything between & including x & y”! Can’t use almond cuz of allergies. How about oats ground into meal or flax seed meal? I can’t use almond meal as we have an allergy in our house. What would you suggest as a substitute. I thought about oat ground into a meal or flax seed meal. I would do a mixture of flax meal, rolled oats, and more gluten free flour blend to compensate for the amount of almond meal I recommend. Hope that helps! My partner had a banana disaster as a kid (read: he ate too many bananas and threw up) so can’t stand the taste of banana. Any ideas on what I can substitute it for that would add the same moistness? Hi, Is there anyway I could make this with out the sugar?? What do you reckon I substitute instead, I’m searching for a yummy gluten free, sugar free bread or cake that I can make a range of muffins from. Hmm, perhaps you could use a liquid sweetener, such as maple syrup, and then compensate the moisture by adding more dry ingredients? We have an almond allergy in our home…..any ideas on what I can sub for the almond meal? I assume any milk would work in lieu of almond milk? Thanks! This looks amazing! Alright so I made this for friends of mine who are GF and it….was…..a disaster. They tell me it was a tasty disaster but the whole loaf fell apart when I tried to cut them a piece. And I don’t mean just that it fell apart, it’s more like you couldn’t eat this with a fork if you wanted to. I mean, the whole thing split in half lengthwise – I don’t even know how that happened. I have pictures. They aren’t pretty ones. I’ll say it did taste pretty good. I’m not used to gluten free cooking so the metallic-y taste really threw me for a loop but once I realized that was how it was “supposed” to taste it was pretty yummy. I addd chocolate chips, made it with pumpkin, and baked it about 15 minutes longer than it called for to make sure it was cooked all the way through. Recommend not to do that. It came out a little overcooked and dry on the outsides. Chocolate was a good call, but then, when ISN’T chocolate a good call. I am determined to keep trying though, and perfect this, once I understand a bit more about gf baking. Thanks for the inspiration! I love tis recipe and wanna try it tomorrow! Do you think it works if I replace the gluten free flour blend for regular flour? Yes! I do. And if you follow the link to the original recipe, you’ll see how she made it with gluten. Hope that helps! Pumpkin and ginger oh yes please. This is it, and there will be an avaricious person with a fork to poke the unwary that hover around this one! ooo I love the idea of squash+ banana. think I could sub in regular AP flour? Hi Dana! 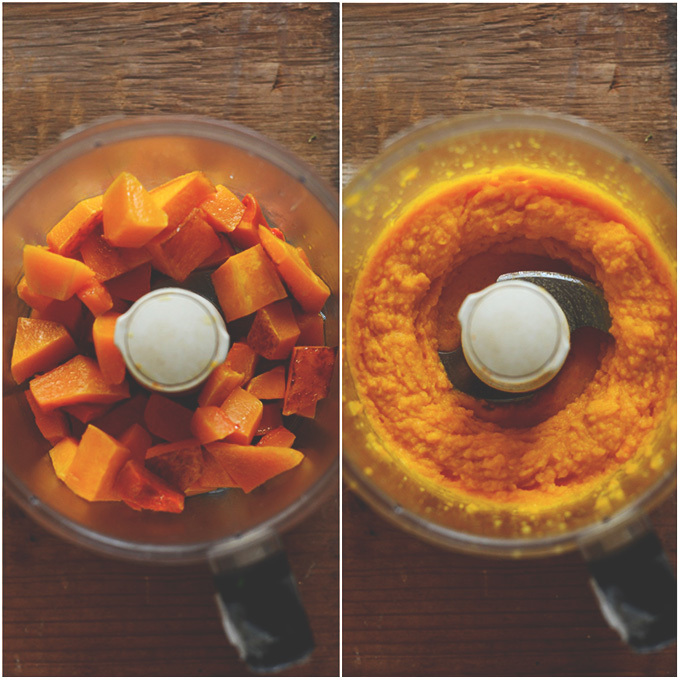 Question – do I puree the butternut squash raw? Nope, you actually bake it first. I peel and cube my butternut squash and roast (tossed in a spot of oil) it for 15-20 minutes in a 400 degree oven. Then puree! Hope that helps. I’ll be sure to better clarify that in the recipe. Thanks! 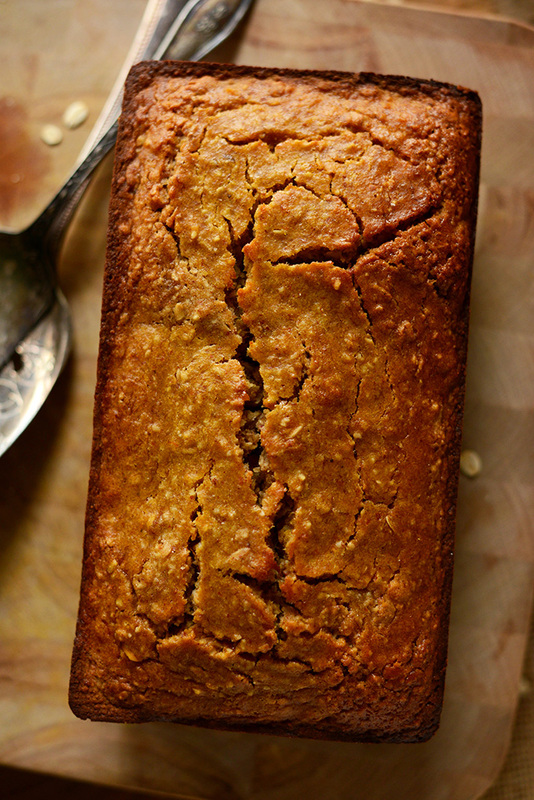 I made this with kabocha squash and white whole wheat flour and it turned out great, the perfect amount of sweetness and pleasantly nutty. The crust was also nicely crumbly and crisp, just the way I like it. Ooh yum! love those modifications. Thanks for sharing, Sydney! How much whole wheat flour (or any flour) an be substituted for almond meal / gf flour blend / oats ? Same question for the banana bread recipe, although I will be using oats. Just baked this. I used two eggs and “Better Batter” for the gluten free flour blend, which has xanthan gum in it. I used buttermilk instead of regular milk and added 1/2 tsp baking soda. Perfect texture; not at all crumbly. Absolutely delicious! Thank you. Can I just use all almond meal for this or will it make it crumbly? Lynz, it will probably turn out too crumbly so I wouldn’t recommend subbing out ALL for almond meal. 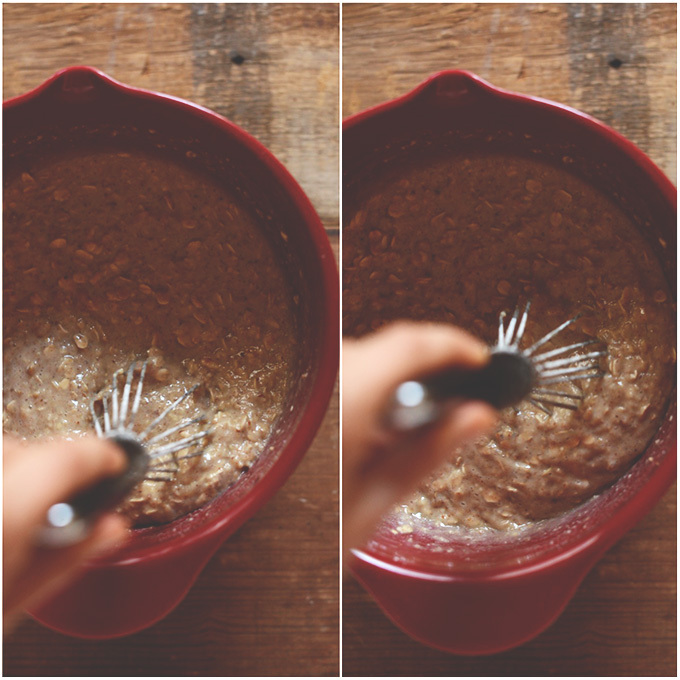 At least keep a little bit of some kind of GF flour (even buckwheat or ground oats) and some whole oats. Hope that helps! I came as cross your website yesterday and made this recipe, wow!!! I substituted the squash for grated zucchini, it was incredible!!!! My husband and I almost ate the loaf in one day!!! Would adding another second egg help bind the loaf more?? I found we could only slice larger pieces or it would crumble slightly, perhaps its the store bought g.f. flour? I turned this into muffins, subbed a flax egg and agave to make it vegan, and used fig butter instead of the squash. The tin is in the oven, so I’ll let you know how it turns out! Thanks for the inspiration Dana! Wow I love the addition of the squash to this. What a perfect seasonal twist to a favorite of mine. thanks for this recipe! i’ve also had a slew of friends going GF… and they’re always asking me what kinds of recipes they can try. i can’t wait to share this one with them… it looks great! bananas and butternut squashes are quite a pair!